Afghanistan food is delicious! It is easy to prepare and typically uses the freshest ingredients. Lamb kebabs, Kabuli Pilau (rice with raisins and carrots), mantu (spicy dumplings), Ashak (sorta like ravioli), green and black tea, and especially naan...Afghan flat bread. These are all delicious foods we regularly enjoy making at home. 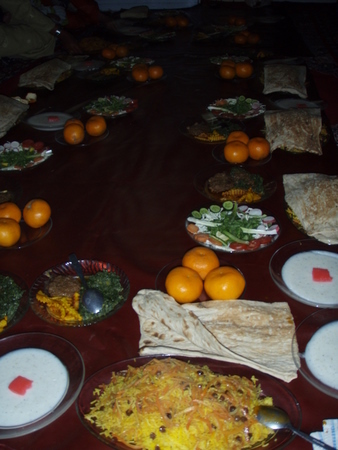 Here, we'll discuss the social customs, traditions, special occasions, and especially the Afghan recipes. This is by no means comprehensive, so please feel free to use the form below to add your own recipes and pictures. You are always welcome to contact me me if you desire a certain recipe you cannot find. Do you love Afghan Food? Do you love Afghan food and cooking it? Does everyone rave about your Kabuli Pilau? Share your recipe and directions! TIP: It may be best to number the steps so the directions are clear. Ghee - what is it? Ghee is like a Ghee is made by first making butter, and then clarifying it. This is done by boiling until the solids settle, and the liquid left on top is strained and cooled. Once cooled, it solidifies usually at room temperature. It can be used in place of the Western lard, or vegetable shortening in recipes. However, it does have a bit of a different taste and may take some getting used to. Don't use it to make large batches of mixes ahead of time, because at room temp, the Ghee will go rancid. On other words, I tried making a large batch of pancake mix to have on hand in Pakistan, and the stuff tasted horrible. Afghan hospitality is renown. When a guest in the home of an Afghan, typically all the best will be laid out.